On first glance, there’s nothing too extraordinary about the Brownstone. In fact, it’s extremely minimalist in its design, with no extroverted decoration – even the bound soundhole and gold headstock decal are quite understated. This won’t please those looking for a bit of glamour for their $500. However, The Loar have put together an all-round excellent instrument, that feels more than worth the cash. With a small pre-war body style, this 25.4” scale length acoustic looks like it could be made entirely of mahogany, although only the back, sides and neck feature this wood – the top is made of solid Sitka spruce, and stained brown, for that rustic, woody feel. Meanwhile, the ivory body binding and silky satin finish give the guitar a touch of elegance. The C-shaped neck is comfortable in the hands, and features a padauk fretboard with 19 medium frets. Playability out of the box is no problem, and feels well set up even though it hasn’t arrived from a small American workshop. With no electronics, you aren’t getting a lot of hardware for your cash, but what’s included is both great quality and appropriate for the rustic bluesy style the brand is going for. Most notably there is a good set of vintage-inspired TonePros TPKR3-N nickel tuning machines with plastic buttons, and a precise 15:1 ratio. There’s also a solid padauk bridge and a bone nut. For this price a gig bag would have been nice, but you don’t feel ripped off in any way, which is almost as nice! First thing’s first – the Brownstone punches above its weight when it comes to sound. A $500 acoustic that could pass for something much higher. Whether it’s the illusion of all mahogany, this guitar sounds beautifully mellow and warm, although the solid spruce top keeps the tone tight and well balanced. For a small-bodied acoustic, it projects better than expected. Top notch! Ultimately the Brownstone is a stylish, great-sounding, no nonsense guitar that’s perfect for blues (but lovely for everything else too). Unless you are particularly looking for an acoustic with extroverted looks and electronics – and if that’s the case, why are you still reading this review?! – the Brownstone has plenty to offer both beginners and experienced players of all genres. 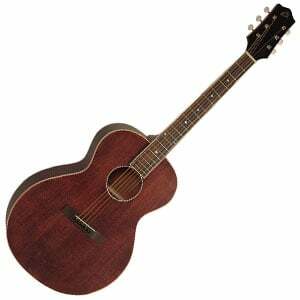 For more info about the The Loar LH-204 Brownstone, click here. For more Acoustic Guitars Under $500 you might like, click here. It’s a sweet-sounding guitar. I recently took possession of one and couldn’t be happier with it. I replaced the strings that came with it for some Martin MM12 Retro Monel Acoustic Guitar Strings (Light, 12-54) and it sounds out of this world. It’s really grown on me. At first, I wondered if I had made the right decision because it sounded like nothing else I had owned previously but this concern was brushed aside after a few plays. And that’s another thing, I find that I’m playing it a lot and writing songs on it simply because it’s just so darn inspiring to play. It’s not the loudest of guitars, due to its pre-war parlour body shape, but this is not really a problem. It’s loud enough. I would recommend this guitar to anyone with confidence. If you’re currently in the market for a new guitar and this is on your shortlist, you’ve made a good choice.